Aware that the online casino industry was becoming awash with service providers who were only after one thing – your money, Dunder was founded by two Swedish gaming fans who wanted to put the fun and enjoyment back into casino play online. So in March 2016 Dunder was born; and they haven’t looked back since. They threw out the mistakes that many online casinos were making, such as slow payouts, cluttered websites and convoluted terms and conditions, and instead created a platform that was easy to use, hassle-free and completely transparent. If you have a query about Dunder they will be only too happy to help….without the need to hide behind an anonymous customer support team based in a call centre somewhere. The end product is an online casino that you will love playing at time and time again; it really is as user-friendly as they come. If you need any further proof then read on! There’s big collections of games….and then there’s Dunder’s collection of games. They’ve got more than 600 titles in total, and don’t be fooled: these are selected based on quality, not just quantity. Whenever you click the play button here you are sure to be delighted. These are handpicked from the best game studios – the likes of NetEnt, Play’n Go, Microgaming, QuickSpin and Evolution Gaming are all present and correct – for their playability and the generosity of their payouts. So naturally you’ll find the best library of slots, blackjack, roulette and table games, and you can even search by your preferred category such as jackpots, expanding wilds, sticky wilds and re-spins (for slots). Whether you want a taste of sporting action, a trip abroad or something rather more laid back, Dunder has everything you need in one place. It’s easy to conduct transactions via Dunder, and thanks to their secure payment network you can rest assured that your personal details are kept perfectly safe. The team prides themselves on being super-fast with their actions, and we really can’t fault them. Withdrawals, which incur a fee of €2.50, are sometimes completed instantly – which really is an industry best. Visa and MasterCard deposits incur a fee of 2.5%, while the other methods (Skrill, Neteller, Trustly) are completely free of charge. Processing times are instant and minimum/maximum amounts range from €20 (minimum) to €5000 (max). Minimum/maximum withdrawal amounts are the same. If you ever have any questions about your account or Dunder as a whole then you can always contact their customer support team via email or live chat. The team prides themselves on being casino enthusiasts, rather than just employees, so you will always get an honest and reliable answer to your questions. All new players are welcomed to Dunder in the kindest possible way: with a huge welcome bonus package of up to €600 available in total! This is backed by 200 free spins on the fantastic Starburst as well; those guys at Dunder really are a generous bunch. First deposit: 100% up to €50 (and those 200 free spins, of course). Second deposit: 50% up to €100. Third deposit: 25% up to €150. Fourth deposit: 25% up to €300. So as you can see, it is well worth sticking around and showing loyalty to Dunder. And the best part is that the wagering requirements are just 25x – this is one of the lowest rates around. The excitement doesn’t stop there either, as the team will frequently send out bonuses and free spins tailored to your gaming activity, so keep your eyes peeled for those. 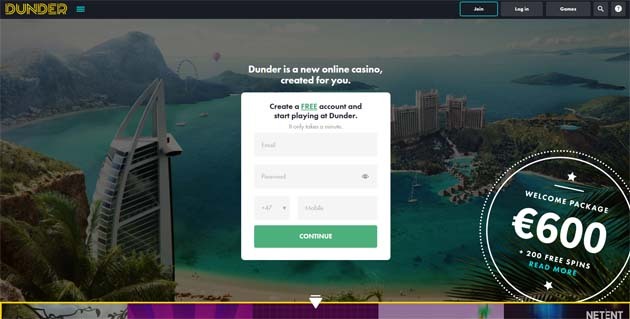 Hopefully, this review has conveyed why you should sign up for a Dunder account today if you are a casino gaming connoisseur who wants to play via a platform created by a team that are as passionate about the industry as you are. The welcome package is a standout feature here: there aren’t many casinos that are offering bonuses even after three or four deposits, and the amounts – including the lowly wagering requirements – actually stack up against the best in the business. How many times have you signed up for an online casino but been disappointed by the game choice/variety of games? No such problems await you at Dunder, where a library of 600 classic games and new releases are on offer. It will take you months if not years to get through all of these!